Your Best Source of Exam Reviewer, News and Updates! As a way of helping you to be familiarized with the Civil Service Examination, we developed online simulated test items and directions with this Reviewer. 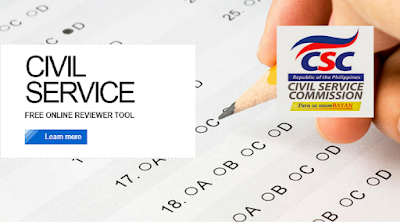 This test help the Philippine examiners to acquire needed exposure to the actual tests they will take. Thus, they are psychologically prepared and this preparedness removes mental block and nervousness which are deterrent factors in passing the the exam. This online CS Examination Reviewer for Professional and Sub-Professional is update every year to make the test exercises conform to actual types of exercise as possible. Choose the test category you want to start answering below and at the end of test you will be able to view the results. Note : We are still developing this tool, once active you will be able to start taking our sample tests from the categories above. Meanwhile bookmark this page and standby for updates..